Not everything you see with your eyes is true, but magic can reveal all that's hidden. Celestia Rainbow and her team of misfits thought they had seen it all. 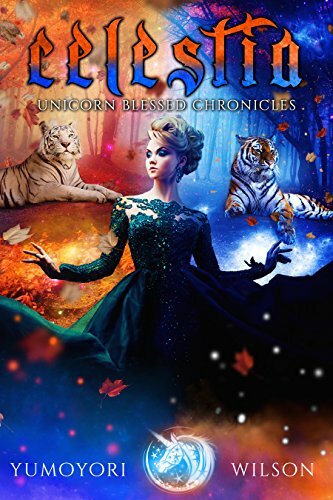 But as they enter a new world filled with mystery and suspense, they are unsure what their future holds at Aslan Academy, School for Hunters and Huntresses. With very little time to recover, they are pushed into a new set of challenges, ones that can either make them stronger or break the bonds they've created. Alliances are made, but evil doesn't stop trying to bring Celestia down a darker path. With the clock ticking and the Forsaken multiplying day by day, it's up to Finn, Hunter, Orion, Theo, Caio and Cairus to guide Celestia back to the light the best way they know how; by loving her with all their might. Will Aslan's badass unicorn be destroyed by the darkness within? Or saved by the men who've sworn to protect and care for her? Only one way to find out. CELESTIA 2 is a new REVERSE HAREM, paranormal series. Recommended for 18+ audiences, containing mature sexual content, violence and strong language. A story of darkness vs light. In this book Celestia and Team Misfit have made it into the real Aslan Academy which is under the watchful eye of her father, Orlando Rainbow. We get to see the depth of the relationships blossoming between Celestia and her guys. Watch it grow into something meaningful. Things are definitely a lot harder this go around. Though Team Misfit had already proven themselves while attending the fake academy, they must compete in the Five Trials. They must overcome hardships they never thought they would face before, some may even get them killed. I love how this series deals with everyday issues we all face at some point in society. It lets us know we are not alone in these feelings and how we can always reach out for help, to lean on others for support. Everybody is their own unicorn. You just have to be willing to let all that glitter shine. It just gets better and better with each book.